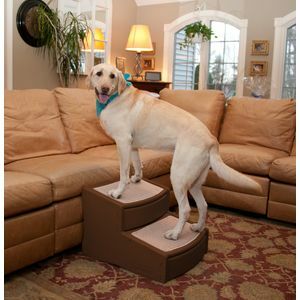 Wider pet stairs are the perfect solution for dogs especially medium to larger dogs. 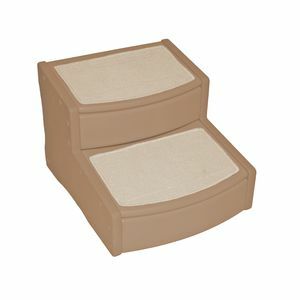 A full 20" wide pet stair means your dog can more easily navigate the stairs. 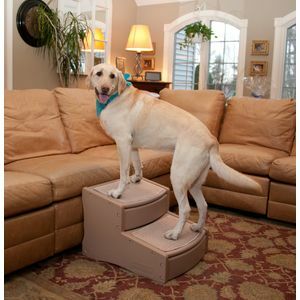 The Easy Step II extra wide stairs have wider and deeper steps making it easier for your dog to climb with less anxiety and greater safety. Most dogs can get all four feet on each platform or step which means a more comfortable climb up and down the pet stairs. The special incline of each step reduces the number of steps need and eliminates stress while navigating the stairs. These extra wide stairs snap together very easily. No tools required. Overall stair: 22"L x 20"W x 16"H.
Top step depth 12.5", 2nd step depth 11.75"
Should your dog need an extra wide 3 step pet stair with the same 20" width, you can find them here.